Voters on the centre-right of politics need to pray that Simon Bridges is not the only winner from the National leadership contest. Hopefully, every MP in the National caucus will need to have learned a few valuable vocational skills about the politics of compromise, horse trading, and coalition building – you know, the things that National has never excelled at in the past. That sort of stuff goes against the grain for a born-to-rule party whose core instincts still belong back in an FPP universe. The lack of those coalition-building skills is precisely why National is not in government today. Yet true to National tradition, Simon Bridges led from the front throughout this contest, and finally got across the line to the 29 votes he needed. One concession to caucus unity is that Paula Bennett – who has strong links to Amy Adams, the other prime contender – will stay on as deputy. It could also be that no other caucus heavyweight wanted the job, under Bridges. Gender balance on the ticket was essential, and Adams had no interest in the deputy job. Bennett was the default option. Clearly, if Bridges fails in 2020, he will be wearing the responsibility for that failure alone. Though Bridges began the morning as the front runner, a first ballot, FPP outcome was always unlikely. A second round of preferential balloting, the need to make sure the losers took home a prize, an overall need to promote the cause of caucus unity…why, to many National supporters on the hard right all this must sound distressingly like the Greens. Has it really come to this, for the party of winner-takes-all? Bridges will have his work cut out competing with Jacinda Ardern – Bennett clearly cannot – but the immediate risk for National will be the defection of some of its female supporters to an Ardern-led government that has already notably engaged with social issues – in housing, health and education – that National had neglected while in government. Bridges and his blokey persona will do little to prevent that erosion from picking up pace, among women voters. At a wider strategic level, National had two rather recent precedents in its rear view mirror, as it headed into the final stretch today. Ultimately, the caucus has chosen to replicate the election of 2002, by picking a new and youngish leader and sending him off on a virtual suicide mission – namely, to win back the Treasury benches only three years after a very long term in office. Bill English was the sacrificial victim who got chosen in 2002, and he had to struggle very, very hard afterwards to resurrect any kind of political career. The other option that the caucus had was to take the election of 2005 as its template – whereby National selected a divisive older figure ( Don Brash then, Judith Collins now) who could inflict enough damage on the Labour government to make victory at the 2023 election a lot easier for their successor. Under this scenario, National losing in 2020 might arguably have left it better positioned for the more winnable contest in 2023, and with its best leadership options still relatively unblemished. In its wisdom, the National caucus has chosen not to go down that path. As a consequence, it could well have set itself up for the same kind of leadership churn that dogged Labour for much of this decade. It was good old Bill English of course, who has put the party in this fix, by doing so much to alienate all of the possible coalition partners of significance. In the days preceding the caucus vote today, both the party rank and file and the Auckland corporate hard right had preferred Judith Collins – and not (as initially expected) Steven Joyce, who (somewhat weirdly) has actually suffered from being too closely associated with the English/Key line of moderation that the Auckland corporate kingpins otherwise claim to love so much. Joyce might be justified in feeling miffed by this rejection. To all intents, the Key/English era was actually a triumvirate, with Joyce as the main fixer who made it happen. In the end though, he had to throw his hat in the ring merely in order to try and protect his current turf, as Finance Minister. Under Bridges, he will lose more ground than he would have done under an Adams leadership. It will be interesting to see if Bridges thinks he can afford to kick Joyce upstairs. For the many who publicly backed Adams – Chris Bishop, Nikki Kaye, Maggie Barry, Tim McIndoe etc – the outcome today may not be much of a setback. 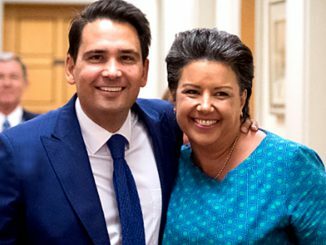 Bridges will need all the help he can get (even with a large caucus to pick from) and Bishop and Kaye in particular are so clearly the future of National in the coming decade, under who-ever is leader by then. Next time around, Adams will be waiting in the wings. Given the immediate challenges facing National, losing today looks a lot more like winning, and vice versa. It is not a pretty sight, but if you want a glimpse of the alternative planet on which the business barons of Auckland reside, check out this newspaper article from a couple of days ago. Also: check out the (lack of) gender balance in the accompanying photo of this august gathering. According to the captains of industry who were chowing down on an exotic- sounding lunch at a luxury lodge in Hauraki Gulf, the outside world is still smacking its forehead in disbelief that New Zealand voters so‘callously discarded’ good old Bill, who – unfortunate metaphor alert – had created what one corporate chieftain described as a ‘Titanic’ economy. Titanic in a good way, that is. There were no social icebergs in sight at Hurikia Lodge. Alas for the tycoon sector, and back on planet Earth… the political polling actually suggests that the country is well pleased with its new PM and government, and the outside world happens to share that view – to the point where it seems utterly delighted with Jacinda Ardern, and has shed nary a tear at losing good old Bill from the global landscape. Footnote: If Simon Bridges should happen to feel that all this sharing and caring stuff today has got a bit out of hand, he can always take solace and good advice from this speech about lions and leadership, delivered by Christopher Walken. Its message: crushers gotta crush. But has Bridges got it in him, to be the king of the jungle? This next track also seems timely. “Captain of My Ship” was a northern soul dancefloor hit for Seventh Wonder back in 1976, the same year that Simon Bridges was born. Talk about prescient!